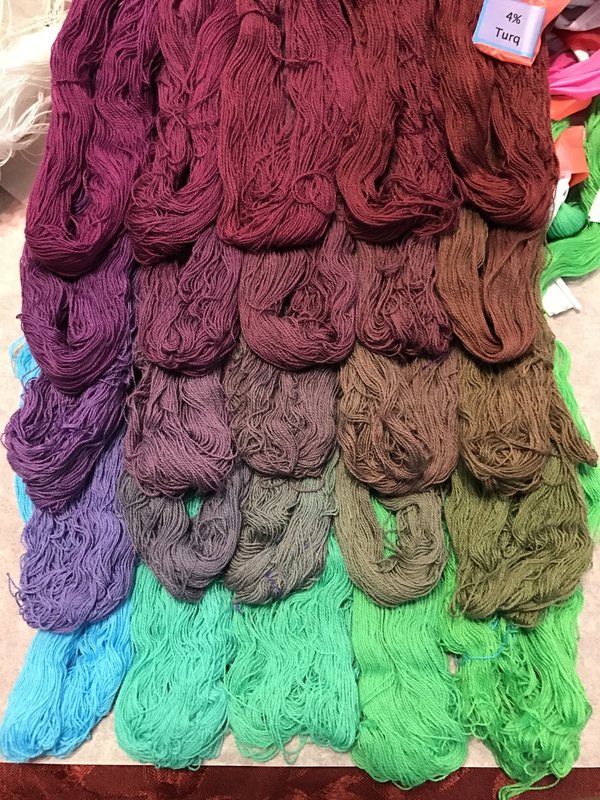 Previous post: First dye cube complete! 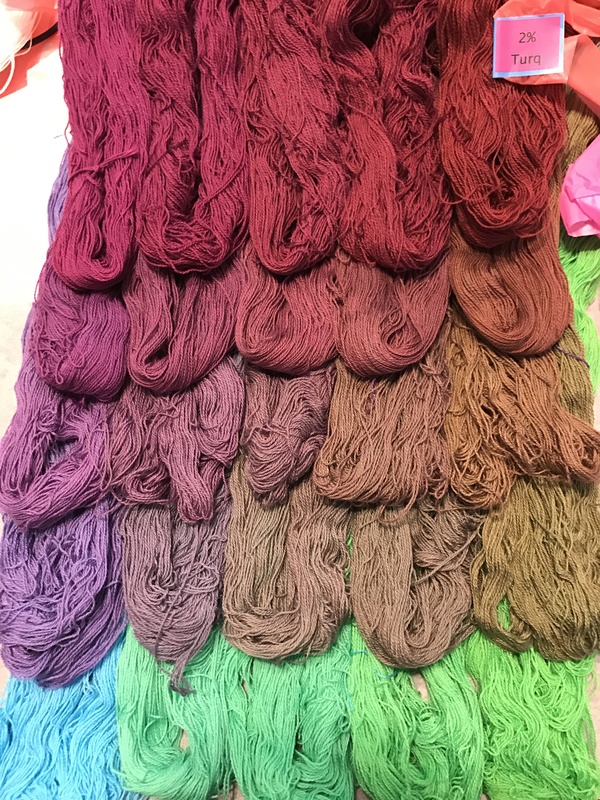 Why am I doing two independent dye cubes rather than one that covers the entire gamut? Because dye cubes over a certain size are inefficient. They produce a lot of samples too similar to be distinguished. 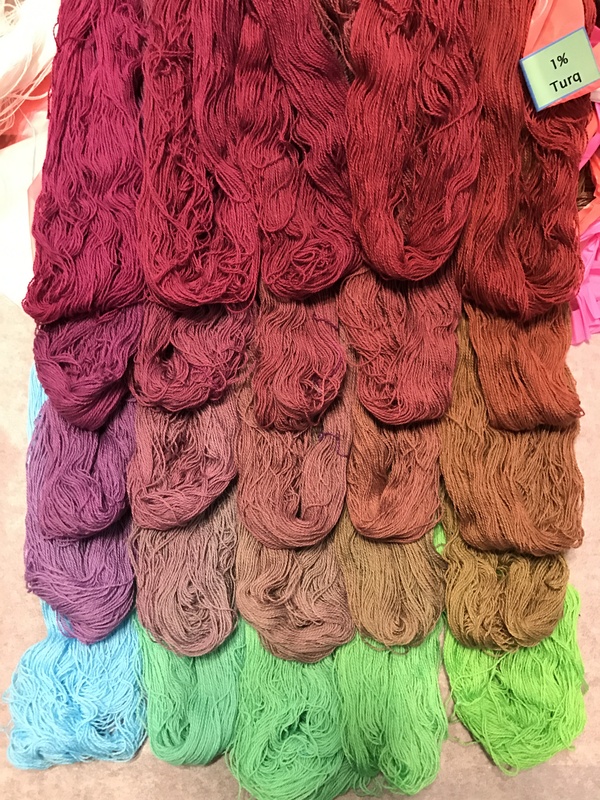 Since each skein costs $0.40, wasted skeins are wasted money. Carol Soderlund uses seven concentrations going up to 3% for her classes. That requires 7^3 or 343 samples. But as you can see, the samples in some sections, as indicated by the turquoise arrows, are very similar. That’s because if you add a very small dye concentration to a very large concentration, you’re likely to see only very small changes. 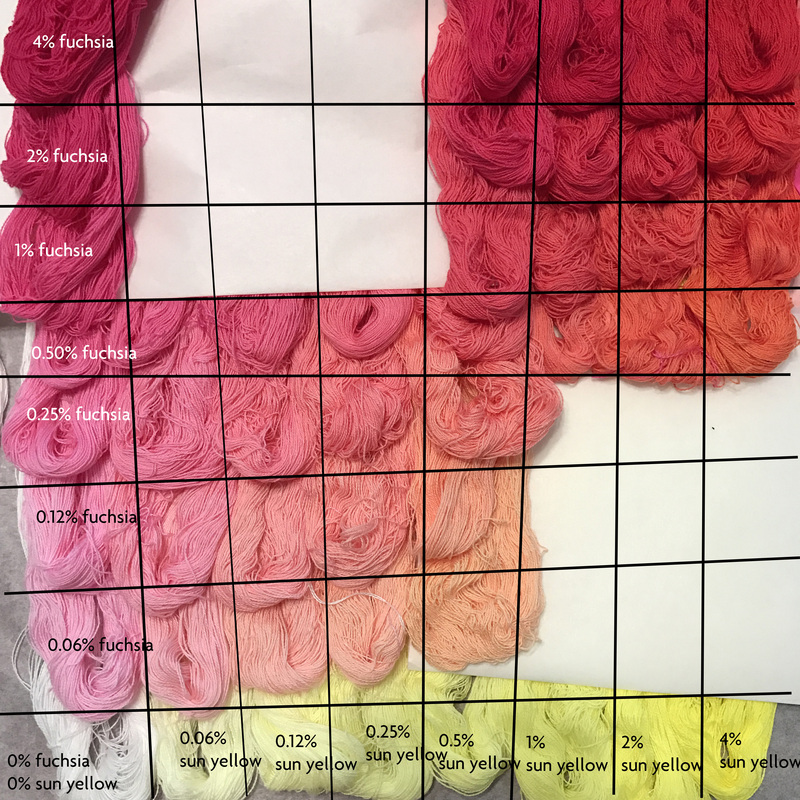 So 0.06% sun yellow + 4% fuchsia is unlikely to look very different from 0.12% sun yellow + 4% fuchsia – the higher concentration of fuchsia overpowers the pale yellows. 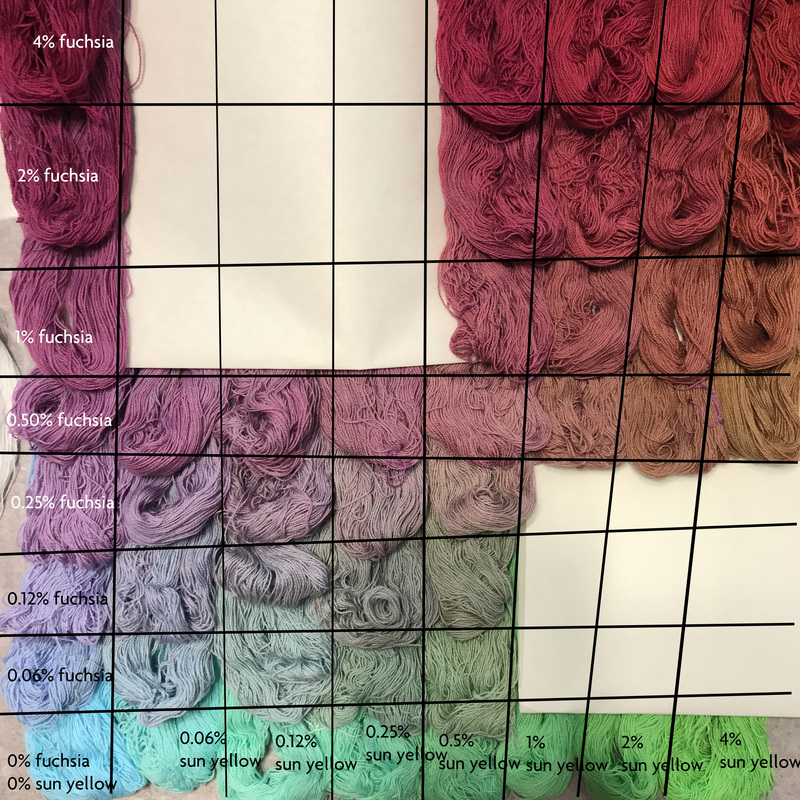 Based on what I learned looking through my friend’s sample book, once one concentration “outweighs” another by more than 16x, the change in color is pretty close to negligible. 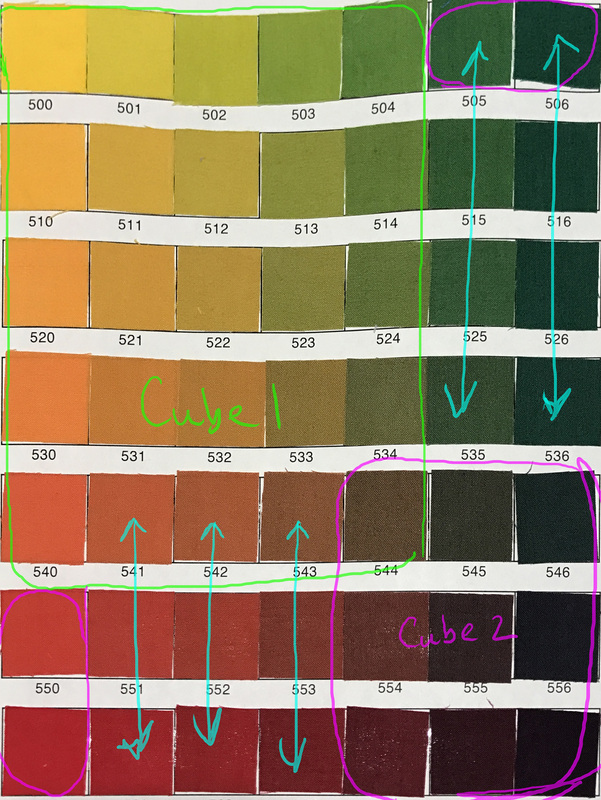 So if you look at the sample page, you can see that you can get more-or-less the full set of colors by doing two smaller cubes – the one outlined in green, and the one outlined in magenta. You do have to include the two samples in bottom left and the two samples at top right (the ones circled in magenta) to get a full set of colors, so the second “cube” actually has four concentrations, since you have to include 0 as one of the concentrations to get the primaries. This doesn’t look like a substantial savings, but it is. At the seven concentrations that Soderlund uses, the double-cube method requires only 5^3 + 4^3 =125+64 = 189 skeins, vs. 343 for the full cube. That almost halves the number of samples, without changing the overall palette much. A much more efficient way of developing a palette. 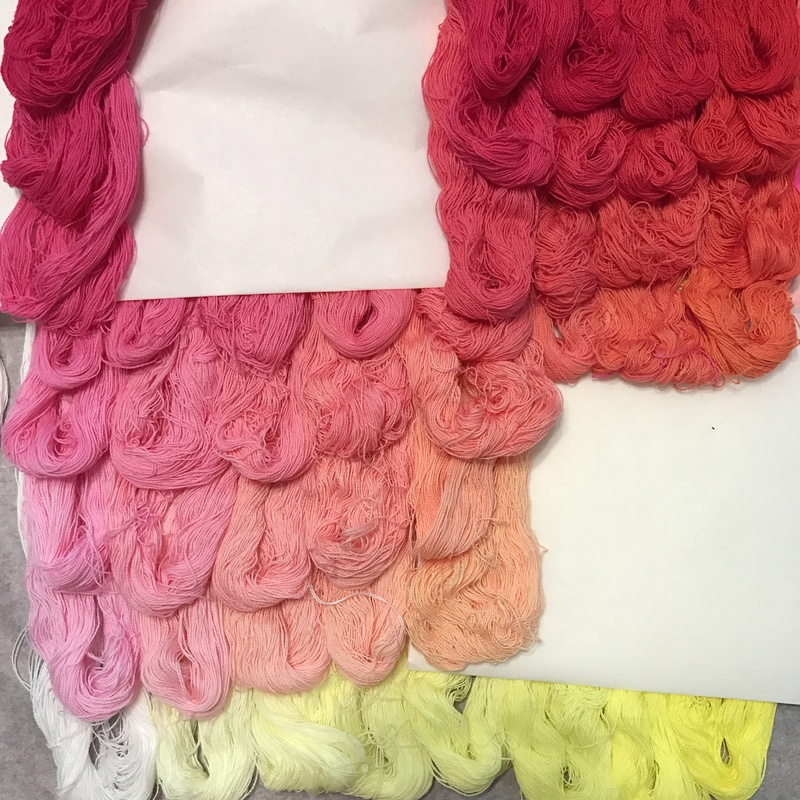 That doesn’t matter much when you’re using small squares of fabric, but with the skeins, which are much more expensive both in $ and time, efficiency becomes important. The choice of concentrations for each cube is based on analysis of my friend’s sample book, looking for the biggest assortment of colors in the smallest number of samples. 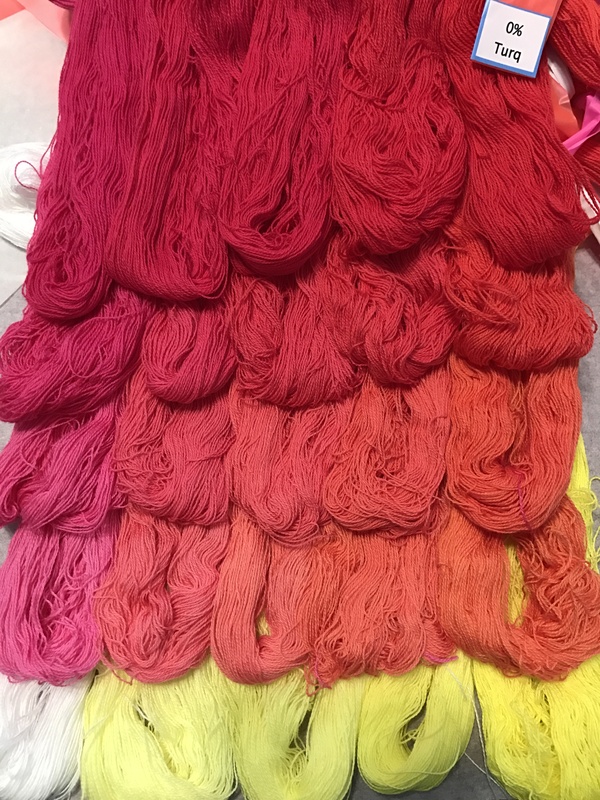 While some colors are missing from the palette, you can see – looking across the rows from left to right – that there is not much difference between 4% fuchsia/0% sun yellow and 4% fuchsia/0.5% sun yellow. So the samples in between don’t really add much to the palette, and can be safely removed. The “missing colors” at bottom right are a little more complex to evaluate, since the difference between the bottom row and the 0.50% row are substantial, but because sun yellow is a really weak mixing color (there’s not a huge difference between 1% and 4%), I’m guessing I didn’t lose a great deal by eliminating those colors as well. If at the end I feel that the palette is incomplete, I can always go back and “fill in” the missing colors. But I’m happy with the results so far. This double-cube method with eight concentrations requires 250 samples (two 125-sample cubes) for each triplet of primary colors. Since my “budget” is 1600 skeins, that means I’m limited to 6 combinations of primary colors (1500 skeins). So far I’ve completed one, so five more to go! Next up will be a set of warm primaries: golden yellow, “mixing red,” and cerulean blue. I’ll start those as soon as it stops raining, hopefully later this week. This is just awesome. I appreciate all the time you invest doing all the samples and put it out here. I’m learning so much. If you ever decide to make a sample book, I will be one of the first to buy it. Wonderful sample set. 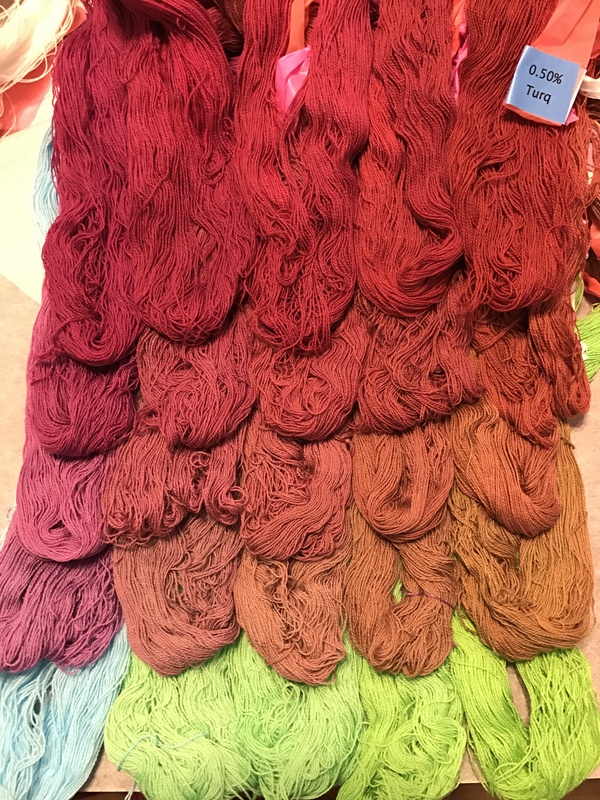 How big are your skeins? The link said 10g, but a fraction of a % of 10g is so small that I’m not sure I own an accurate-enough balance to measure those. Or are you dissolving the dye powder and making volume measures rather than weight measures? Wow. I feel as though I’m getting an education in color just from your blog posts. Perhaps this is a topic for your next book?